Home / Entertainment / Headlines / TV / Karan Johar to host show ‘Comedy Nights with Kapil’ ! Karan Johar to host show ‘Comedy Nights with Kapil’ ! Mumbai : Now Kapil Sharma would not be able to continue his popular show 'Comedy Nights With Kapil' as he is advised to bad rest following his slip disc injury. This show is not only [popular in India but also across globally. According the reports, "Kapil Sharma has suffered a slip dics injury and advised to take bed rest by doctors so cannot be able to continue host the show. If channel want to continue this show then need new host." 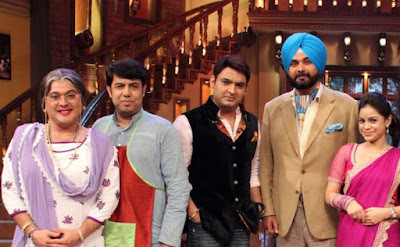 Comedy Nights with Kapil is an Indian sketch comedy show that premiered on Colors TV on 22 June 2013. Many episodes feature celebrity guests who usually appear to promote their latest films in a comedy-focused talk show format. The show became India's highest rated scripted TV show. The Famous Phrase 'Baba Ji Ka Thullu' is Introduced by Kapil Sharma in this show which instantly become a sensation and took the Country by storm. At CNN-IBN Indian of the Year awards, Sharma was awarded the Entertainer of the Year award for 2013.